Bass clarinetist and composer Todd Marcus brings his quartet back to Washington, DC for a January 28th show at Blues Alley with pianist George Colligan, drummer Warren Wolf, and bassist Kris Funn. The high energy band will perform new music plus picks from its album Inheritance which was selected by National Public Radio as one of the top jazz albums of 2012. 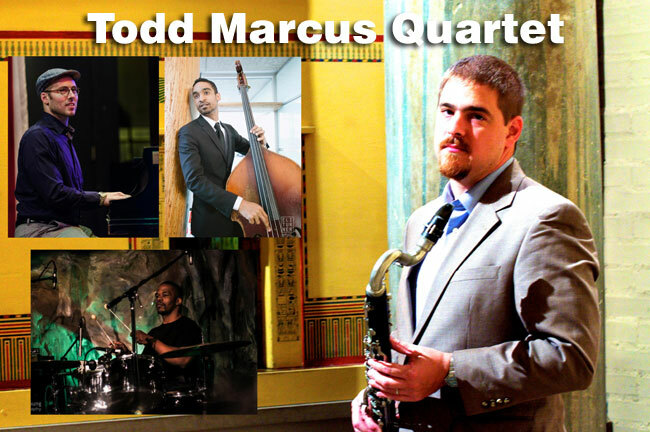 Marcus’s work has received accolades including a $25,000 Baker Artist Award in 2014 and selections as a rising star by national jazz magazine Downbeat in its 2014 and 2013 annual critics poll. His music has also drawn attention for its unique incorporation of Middle Eastern influences inspired by Marcus’s Egyptian heritage. Washington, DC bassist Kris Funn has toured internationally with alto saxophonist Kenny Garret and Christian Scott along with performances by artists such as Nicholas Payton, Pharaoh Sanders, and Jeff Lorber.